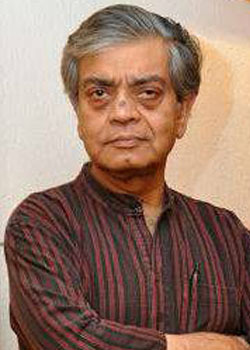 Sandip Ray (born 8 September 1953) is a film director living in the city of Kolkata, West Bengal, India. He is the only son of the noted Bengali director Satyajit Ray, and Bijoya Ray. RHe started his professional career in film at the age of 22 as assistant director on his father's film Shatranj Ke Khiladi (The Chess Players, 1977). Prior to this he had aided his father's work in various capacities including still photographer on set. His own directorial debut was Phatik Chand (1983) -- the film received an award in the International Children's Film Festival in Vancouver. Sandip Ray is also a noted photographer. He was the director of photography on Satyajit Ray's last three films, Ganashatru (An Enemy of the People, 1989), Shakha Proshakha (The Branches of the Tree, 1990) and Agantuk (The Stranger, 1991). Sandip Ray also guided the children's magazine Sandesh, which was founded by his great-grandfather Upendrakishore Ray, and continued by his grandfather Sukumar Ray and his father Satyajit Ray. From 1992, after the death of Satyajit, Sandip was the Joint Editor of the Sandesh (magazine). Since 2003 he has been the editor of the magazine. Sandip Ray has recently come up with his account of the time he has had with Feluda, the famous Bengali detective created by his father, in a book named Aami aar Feluda, published by Deep Prakashan. Aami aar Feluda was one of the best sellers in the last Kolkata Book Fair. First published in the magazine Sukhi Grihokon as a short series, Aami aar Feluda retains the flavour of Ekei Bole Shooting, written by Satyajit Ray. Sandip's book deals with the background stories of all Feluda Movies and Telefilms. Aami aar Feluda is ghost-written by author Sebabrata Banerjee. Sebabrata has tried to follow the smart and fluent style of writing introduced by Satyajit Ray which has made the new Feluda number a good reading experience. He has made a video-documentary film on Late Kishore Kumar in the year 1989. In 2003, Sandip Ray began working on adapting his father Satyajit Ray's original 1962 story Bankhubabur Bandhu into a Bengali television film of the same name. The film, directed by Kaushik Sen, was eventually shown on Indian television in 2006. He started to score background music for Feluda from the film Bombaiyer Bombete, 2003. Sandip Ray used his first written thriller story for his own directed film Hitlist, 2009. Currently he is busy in making film on 'Tarini Khuro' which is also an interesting character created by Satyajit ray besides Feluda and Prof.Shanku. He has also planned for filming Prof.Shanku in 2013. National Film Award – Special Jury Award / Special Mention (Feature Film) at the 34th National Film Awards for Himghar.